This salad is almost salsa like in its look. It is a nice addition to any summer meal. I love it served on a bed of rice, chicken breast or on its own as a side dish. I got this recipe from my cousin and I really don’t have actual amounts for the ingredients, so I just wing it. I don’t know where she got the original recipe from, but here is what she passed on to me. The quantities in parentheses are the approximate amounts I used. Place all of the ingredients in a bowl and stir. 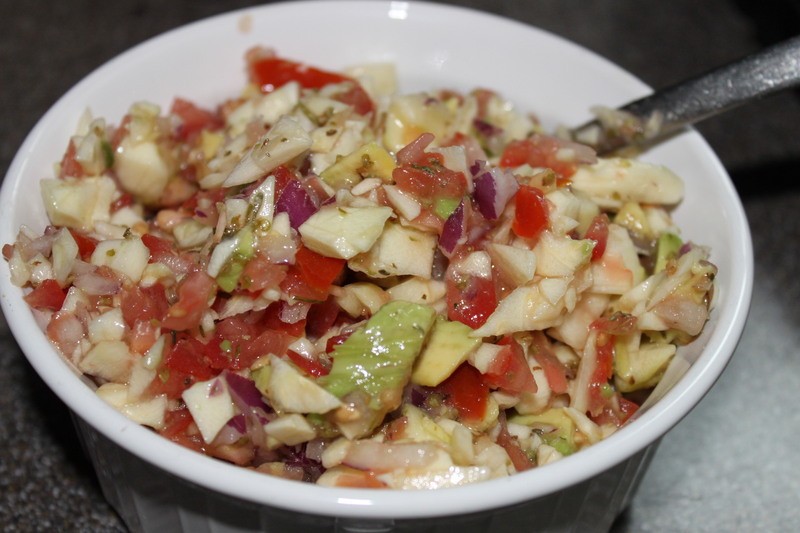 I find that this type of salad/salsa is best when left on the counter for about 30-60 minutes, so that the flavours can blend together. If you have the time to let it stand before serving, I would suggest holding off on the avocado and adding it just before you are ready to set it out. Epicurious had a version of this recipe, but the dressing called for basil, oregano, oil, salt and pepper and the choice of using either balsamic or red wine vinegar. To check-out the recipe, follow the link. Oh Snap! Let’s eat! had another version that included cilantro, which I love. I also thought that the idea of thinly slicing the zucchini with a peeler to create a ribbon effect was a really cool idea. Follow the link to check out the post. Posted on June 13, 2014 by Cindy Roy •	This entry was posted in Recipes, Salads & Vegetables and tagged summer salads, Tomato Zucchini Avocado Lemon Salsa, Tomato Zucchini Avocado Salad, Tomato Zucchini Salad. Bookmark the permalink. Another gotta-try recipe. Thanks Cindy and Diane too. I love salad.